Prefabricated data center modules dramatically reduce deployment time and complexity, while ensuring reliability within the data center. IT Modules combine the functionality and space of a typical IT room with the benefits of a pre-engineered system and factory assembly to ensure an efficient solution from design to operation. Integration of power distribution, cooling, racks, security and fire suppression and a best in-class DCIM system (Struxureware Expert) into a purpose built enclosure, these modules are deployable within a building structure or can withstand extreme weather in an outdoor environment. For small or remote data center applications, IT Modules are available as self-contained, all-in-one data centers that include a UPS and DX cooling. For medium to large data centers, IT modules are used together with power and cooling to achieve a scalable and flexible data center design to meet your specific application. Choose from one of our base designs or allow us to customize a solution to meet your needs. SmartShelter Data Hall offers a scalable, data center infrastructure solution for large service providers and enterprise customer deploying in 50-100 rack increments with the ability to easily add future capacity. The solution consists of factory-built IT modules with 14-15 racks, ganged together on-site, with minimal construction, to form a large, functional IT room. Locate data center outside or into a simple building shell as a stand-alone system that has physical security, power and cooling redundancy, and can be remotely monitored and managed with a full suite of DCIM software. 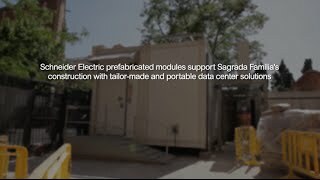 - Decrease risk with a pre-engineered, fully managed system - Preserve CapEx by growing infrastructure with demand - Adjust plans for future expansions with repeatable and flexible designs SmartShelter Data Hall contains complete data center physical infrastructure, assembled and tested in a multiple-module configuration to provide a fully functional data center.